An enthusiast has spotted two mysterious UFOs on the surface of the Moon, observed in footage captured by Chinese lunar Probe Chang’e 3 – images appearing to show a humanoid structure and a hidden alien spaceship. It’s important to take any evidence of mysterious UFOs with a grain of salt, as there has yet to be any concrete evidence that points to the interference of intelligent extraterrestrial life – at least not that we can explain, that is. A news story that broke late last year about a secret government agency dedicated entirely to investigating mysterious UFOs once again brought the possibility of alien interference to the forefront – but while there are definitely phenomena that we can’t easily explain, it also doesn’t give us a lot of evidence as to the actual existence of aliens either. The suggestion that these mysterious UFOs are actually evidence of alien life on the moon comes from a Scottish UFOlogist naked George Graham, who analyzed a few different photographs and believes that there is, indeed, an alien presence behind these objects. There are several videos in which Graham explains these bizarre images. 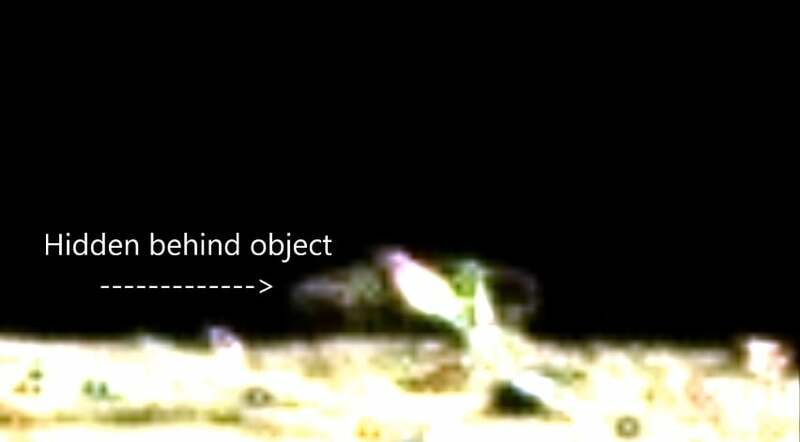 The first of the mysterious UFOs that seem to be shown in the photos captured by the lunar probe seems to show a humanoid creature. It’s important to recognize the potential influence of pareidolia in any case like this – meaning the tendency of the human brain to create a recognizable image from unrelated patterns – but it’s still definitely a bizarre occurrence and a strange image that is difficult to explain. Over the course of the video, Graham explains that he believes the humanoid creature is an alien and probably wearing a helmet and a visor – both of which he states are clearly visible. The proportions of the humanoid behind these mysterious UFOs also seems to be quite similar to our own, which raises the possibility that another form of intelligent life could be lurking closer than we’d think. The second video seems to show one of the mysterious UFOs hiding behind a rocket. The photo was originally captured by Chang’e 3, as mentioned above, and shows a flying saucer-like creation hidden behind a rocket. Graham has amassed a significant following on his YouTube channel, with more than 70000 subscribers and more than 44 million hits on his videos. These photos of the mysterious UFOs are definitely strange, and there’s not an easy explanation for how they appear – at least at first glance. While Graham does have a significant following that tunes in to hear his opinions on various mysterious UFOs, the images are anything but an assurance of alien life. The videos, included below, show images that aren’t exactly high-definition and could easily be explained away as some sort of weird rock formation. With that said, many mysterious UFOs have been discovered, and enthusiasts and many researchers alike believe that it borders on arrogant to assume humans are the only form of intelligent life out there. The likelihood of these mysterious UFOs on the moon actually being the existence of alien life are low considering our close access to the body, but there’s certainly a very real possibility that we aren’t alone out there. In addition to these two videos, people in the Southwestern part of Bristol, United Kingdom got to see mysterious UFOs move across the moon – illuminated by the bright background. One witness reports seeing a strange glow after which the mysterious UFOs moved across the surface at a high speed. Whether these mysterious UFOs are actually alien life or are more easily explainable remains to be seen. Check out the videos of the images below for a better look.